Once laminated, you can attach the velcro to move the body parts around the yes/no color coded chart. The green (yes) and red (no) chart allows for additional visual support. Can be used throughout the day to demonstrate appropriate behaviors. 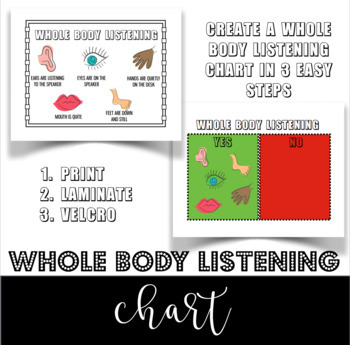 A visual - explains what the whole body (mouth, eyes, feet, hands, ear) does during "good listening"